Listed at number 40 on the World's 50 most delicious foods readers' poll conducted by CNN Travel in 2011, Bibimbap is a popular Korean delicacy. ‘Bibim’ means mixing and ‘bap’ means rice. Bibimbap is basically a bowl of cooked rice topped with sautéed and seasoned vegetables, chili pepper, soy sauce and sometimes, egg or beef. In Korean restaurants, Bibimbap is sometimes served in a sizzling hot stone bowl which gives the bottom layer of the rice a nice golden crust. The mixing is usually done at the table. A timeless meal, Bibimbap was first mentioned in the 19th century cookbook, Siuijeonseo and it is served in recent times in most Korean households and on many airlines connecting to South Korea. Mix various vegetables and fish to achieve variety. 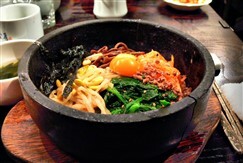 Bibimbap can be made from leftovers of side dishes used for other meals. 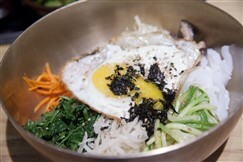 Described as the champion of comfort foods by Claire Potter of theguardian.com, Bibimbap is believed by the Koreans to heal the body, release energy and keep illness away during winter.